Big Belfast usually takes a back seat to Dublin, but it is a capital city in its own right with some interesting sites and experiences, like the Titanic Belfast. The RMS Titanic, along with her sister ship the Olympic, were constructed in specially built dry docks by Harland and Wolff Shipbuilders on Queen’s Island, which is now known as the Titanic Quarter, in Belfast Harbor. On the site where the great ships were built sits Titanic Belfast. Titanic Belfast opened in 2012 as a tourist attraction to tell the story of the ill-fated ship. The RMS Titanic has become legendary and its tragic fate is known all over the world. Titanic Belfast draws over a half million international visitors a year to see where she was built. It truly is an impressive exhibition. It takes you on a historic journey from the heydays of Belfast and the building of the Titanic to its sinking and aftermath. There are even relics brought up from the wreck on the sea floor on display. Like most people, I learned the story when I was a kid, but really never understood all of the details. I was very interested in going to the museum. I was awed to stand in the exact spot where Titanic was built and launched. You get a genuine sense of the size and scope of the construction. We walked and walked and walked all around the place. You can easily spend several hours there. We got a late lunch at the museum restaurant and called it a day. We probably missed a few things, but came away much more of an expert on Titanic lore. Titanic Belfast is well worth the visit. To be honest, we didn’t find anything else in Belfast worthwhile. We decided to head out of town to Dublin back in the Republic of Ireland. Even though Londonderry was a disappointment, Northern Ireland does have some amazing places. When we were in Ireland the last time, we did not have time to make it up to the northern extreme. This time, however, we had made it. One of nature’s most amazing geologic formations can be found on the island’s north shore in Country Antrim and I really wanted to see it. Called the Giant’s Causeway, this unique volcanic basalt formation is a UNESCO World Heritage Site and a true Irish gem. How this strange landscape was created is a subject of debate. Science tells one story and local legend tells another. even though I’m a science teacher, I kind of like the legend one actually. 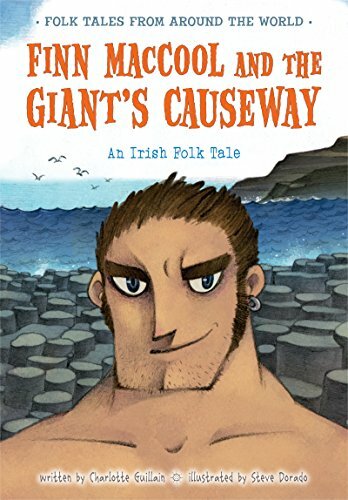 According to locals, a certain cocky giant by the name of Finn McCool built the causeway. Apparently, Finn was having trouble with some rude and aggressive giant across the water in Scotland. The giant, Benandonner, was threatening Ireland, which Finn would not tolerate. An enraged Finn grabbed large rocks from the Antrim coast and threw them into the sea to make a path to reach Scotland so he could teach Benandonner a lesson. When Finn finally reached Scotland, he realized it was a bad idea. He didn’t see from afar that Benandonner was terrifyingly massive. Wisely, Finn beat a hasty retreat, but the giant followed in pursuit. Luckily for Finn his wise wife was quick thinking. She disguised him as a baby. The angry Scot saw the baby and decided if the child was that big, his father must be really huge. The scared giant bid a hasty retreat back to Scotland destroying most of the causeway in the process. Finn was saved. The scientific explanation is not as interesting, but probably more accurate. Today we are technically leaving the Republic of Ireland for Northern Ireland, one island, but two countries. Ireland has a long and bloody past do to civil war and invasions. I remember as a child in school learning about “The Troubles” as the Irish call them. the seventies, eighties, and nineties were bad times in Northern Ireland, which was and is still part of the United Kingdom. 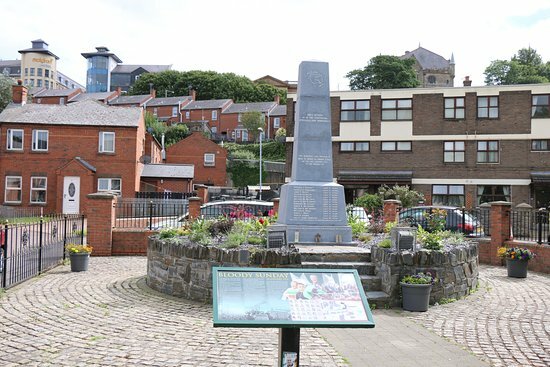 Violent clashes between Protestants, mainly Northern Ireland, and Catholics, mainly Republic of Ireland, resulted in over 3,600 dead. The nexus of the strife was Londonderry, our net stop. We were quietly driving north on N13 admiring the beautiful Irish countryside with its lush green hills and neat colorful cottages when something changed. There were no signs or markers, but we definitely crossed into another place. The differences were startling. The bright and cheery farm cottages were replaced by drab brick townhouses and instead of tidy hedge rows there were brick and chain-link fences. Gone was the charming pastoral landscape. Litter shockingly fouled the streets and graffiti marred many walls. What happened? It was as if we passed through some unseen portal to another time and place entirely. What we unknowingly did was cross from the Republic of Ireland into Norther Ireland. 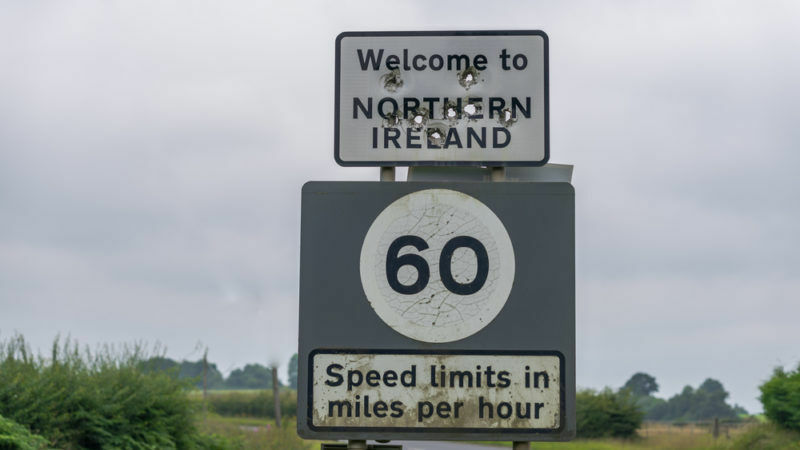 Both Irelands agreed to a “soft boundary” with nothing to announce a border crossing. Despite the lack of a visible checkpoint, the division was glaringly obvious. We were amazed at the contrast. We made for Londonderry, where we reserved a townhouse for two nights. Luckily, the home was nice, but the area around it was not. Everywhere we looked were murals depicting the civil unrest that still plagues the country. True lasting peace has remained elusive. As we were sitting in the living room of the home, it dawned on me that this was the site of the Bloody Sunday Massacre! 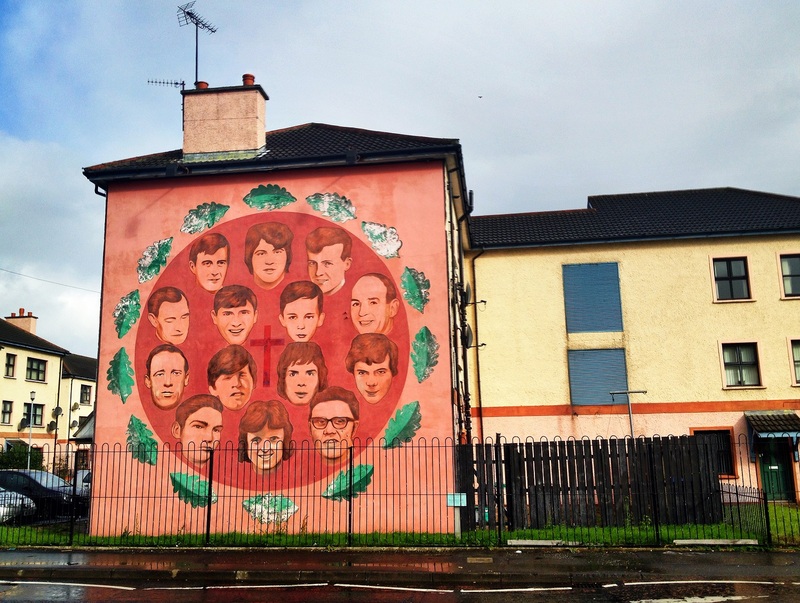 The Bloody Sunday Massacre was the single deadliest day during The Troubles. British soldiers fired on unarmed civilians during a peaceful protest killing 13 of them on January 30, 1972. The Irish rock band U-2 commemorated the incident in their hit song Sunday Bloody Sunday. I remember when the song debuted on the radio in 1983, but really didn’t understand its lyrics until now. We visited the memorial to the slain and the words of the song came hauntingly back to me. I wold like to say that our visit to Londonderry was as amazing as the rest of our trip, but it wasn’t. The cold grey rain only added to the somberness of the scene. At least I was able to impart some history to Elijah. I’m glad we saw the city, but would not recommend it for a family adventure. We have been driving for two weeks clock-wise around Ireland and now are opposite Dublin on the west coast. We took some back roads from Kylemore Abbey to Westport through some remote and rugged mountainous country of County Mayo. I am glad to see that even in a country as old as Ireland, there are still wild and unspoiled areas. We drove for about an hour without seeing a single house, which amazed us. We have been saying it for the last two weeks, but Ireland truly is a beautiful country. Eventually, we came back to the main road and continued north at a faster pace. Westport is one of Ireland’s coastal resort towns. It was rated in 2012 as the Best Place to Live in Ireland by the Irish Times. Irish beach goers flock to it during the summer to catch some sun rays, splash in the water, and enjoy the local restaurants. Since we are traveling in early June, we have fortunately missed the beach crowds, so we largely had the area to ourselves. We were pretty hungry from driving, not that sitting in a car burns much calories, so looked for a place to eat. Westport boasts some very good restaurants and pubs, which made choosing just one difficult. We selected JJ O’ Malleys, Westport’s most famous bar and restaurant (self-proclaimed). We made the right decision! The food was outstanding. We all ordered some type of seafood entree caught fresh in the nearby Atlantic Ocean. My sea-bass special was particularly delicious. The atmosphere is also amazing. It is a combination of rustic old-world charm and authentic Irish warmth. The staff was very friendly too. This was one of our best meals in Ireland. After dinner, we decided to call an early day and head for our B&B. Collette Moran’s home was definitely off the beaten path, but well-worth the extra effort. Her home was immaculate and comfortable. We loved that it was out in the country with awesome views of the mountains and farmland. We all slept very soundly. This is our last night in the Republic of Ireland for a while. Our next B&B will be in Derry, Northern Ireland. Kylemore Abbey has got to be the most beautiful castle setting in all of Ireland! I have seen many pictures of Kylemore Abbey. Indeed, if you Google Irish castles, it always comes up as one of the top picks. Like most of Ireland, words and pictures fall short of the real thing. You need to experience it to truly capture the beauty and aura of the Irish countryside. Kylemore started out as a private residence for Mitchell Henry, a very wealthy doctor from London. He, like many others, fell in love with the area. He and his wife, Margaret, built the castle in 1868 and settled down to enjoy a very lordly Irish life in the remote area of Connemara County. Their castle spans over 40,000 feet, 70 rooms, and 10,000 acres of land. Not bad for a second home in the country! Tragically, Margaret died in 1875 at the young age of 45 from a fever she contracted while on holiday in Egypt. Mitchell build a small, but beautiful, memorial church on the shores of the lake in memory of his wife. Eventually, he also was laid to rest next to her in the mausoleum. The castle was then sold to the Duke and Duchess of Manchester in 1909. After only a few years, however, the Duke lost the castle in a gambling bet. If I had been his wife, he would have joined Mr. and Mrs. Henry! Luckily, the castle went to a good home. The Irish Benedictine Nuns purchased the castle in 1920 after fleeing their abbey in Ypres, Belgium, during World War I. They converted the castle to a private international girls boarding and day school, which operated until 2010. Today, they still own the abbey and maintain it as a retreat, educational place, and historical site to the public (€11.70/adult). The nuns have done an impressive job keeping Kylemore in pristine shape. The castle is open for guided tours. There is also a wonderful cafe, gift shop, Victorian walled garden, and hiking paths to explore. Although a bus runs every 15 minutes from the abbey to the gardens, we elected to walk the mile and enjoy the scenery. The Victorian walled garden was impressive! Mish gladly would accept living in the head gardener’s cottage. I still would opt for the castle. We had our usual afternoon tea in the garden restaurant and imagined what life would be like living here. Providing I did not have to keep up the yard work, not bad at all. We left the city life of Galway behind and headed for the remote Irish countryside on our road-trip around Ireland. Our scenic drive took us along Lough Corrib, the largest lake in Ireland, to the quaint town of Cong. If you are a John Wayne fan, you might recognize this picturesque spot as the fictitious town of Inisfree in the movie. We can see why director John Ford picked this location, it is one of the most beautiful areas we have seen so far on this trip. Enviously, I watched as a few fly-fishermen cast their lines into the Cong River in search of salmon. A young girl walked by with her father caring a salmon almost as long as she was! I really wanted to get my rod and real and go after one, but unfortunately I left them back in the U.S. Oh well, just one more reason to come back to Ireland. We strolled through the ruins of Cong Abbey. Apparently, the local monks used to fish in the river for their supper. Lucky guys! 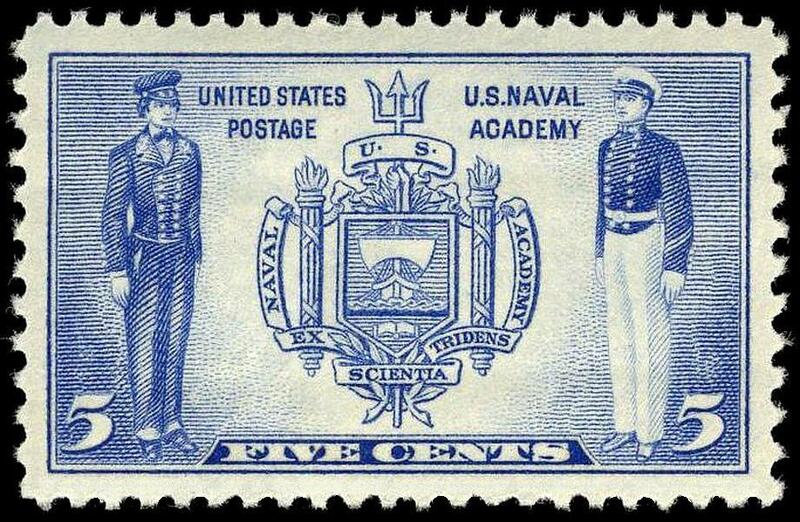 I guess they didn’t have a problem recruiting some men to their ranks. We crossed the river and continued through an old stone arch to a nature trail that meandered through the woods. About a mile into the wood, we saw a sign for Ashford Castle, so, of course, we had to investigate. The path opened up onto a large well-manicured green lawn. Across the yard was an imposing dark grey stone castle. Elijah and I realized straight away that we were not supposed to be here. Mish, however, wanted a better look. We hung back on the edge of the wood as Mish boldly walked out across the lawn. Sure enough, a dapper dressed castle guard driving a golf cart came out of nowhere in pursuit. Elijah and I bid a hasty retreat back into the safety of the wood. I really hoped Mish did not get detained. Luckily, she shortly came back giving us a very disapproving look. We’re not cowards, just more cautious. We decided to keep to the woods and follow the path. Deeper in we found Guinness Tower. This six story stone structure was built by Benjamin Guinness, who was the grandson of no other than the legendary Arthur Guinness himself, as an observation platform. It sits alone in the dark forest as if it is not supposed to be discovered. There is definitely a fairy tale quality about it. We climbed the old steps inside to the top, where we were rewarded with a view of the forest canopy. Only in Ireland can you stumble across old castles and ruins when out for a short walk. We climbed down and went back into town. We had worked up an appetite so sat down for a late breakfast in The Hungry Monk. We all had eggs with fresh salmon. The meal was delicious and the servers were very friendly and welcoming. It doesn’t get more authentic Irish than this! To top of a lovely morning, we came across a Guinness truck parked in the middle of the street. Can it get any better? Our next stop is Kylemore Abbey. I have seen many pictures of this castle and am very anxious to experience it in person. So, I will let everyone know if it is as impressive as the pictures. Galway is an amazing cosmopolitan city with lots to do and see! All I knew of Galway was the famous song Galway Girl by Steve Earle (an re-recorded by Ed Sheeran). Needless to say, that didn’t really help me much. So, we went out to explore the city. Since it is the sixth largest city in Ireland and home to a major university, we had high expectations. Galway did not disappoint! The city is very cosmopolitan. The nice lady at the visitor center told us that 1 in 4 city residents were not Irish. The well-regarded university, ocean port, beautiful surroundings, mild climate, and plethora of shops and pubs draws people from all over the world. We could hear numerous languages as we walked around the city. Probably the busiest place is Eyre Square in the heart of Galway. We found many interesting shops and eateries. There were also several talented street performers entertaining the crowds. We worked up quite an appetite and decided to find a good pub. Mish found out that today was the Hurling Championship and, coincidentally, one of the teams playing was from Galway. If you do not know what hurling is, your not alone. This unique sport is almost exclusively played in Ireland. It is of Gaelic origin and dates back to over 4,000 years. That makes the game older than Ireland itself! The sport can be traced to the Celts and has prehistoric origins even. The best way I can describe the game is that it is a mix of lacrosse, rugby, and quidditch. The main difference is that those sports are safer. Hurling is fast, furious, and dangerous. We sat in a pub and watched the match while we ate and drank. A very nice older gentleman sitting next to me patiently explained the game to us. I had to ask many questions because the game is like nothing I have ever seen. He told me that when he played as a young man players didn’t wear helmets. He got a shattered eye socket one time from an errant silotar (that’s the hard ball you use). Another time he got a hurley (that’s the stick players use to hit the silotar and each other) in the throat. And they play this game why? I’ll admit, it was loads of fun! We rooted for Galway and toasted their victory. Back out on the street people were still out walking around and socializing. The lights came on and the city took on an even prettier look. Galway is definitely worth a visit when you are on the west coast of Ireland. We missed the Cliffs of Moher on our last visit to Ireland, but this time we made it a must see destination. The Cliffs of Moher are not the tallest sea cliffs in the world, but they are some of the most dramatic. They are sheer vertical walls of rock that rise over 390 feet from the ocean. They are located in County Clare at Hags Head near the small coastal resort town of Doolin. The area is well known for its famous golf courses, which we passed up. I still have yet to play a single round of golf and plan on keeping it that way. The cliff had much more fascination for me. Be aware, between the golfers, bicyclists, and cliff watchers the roads get pretty crowded. You will need to go slow and constantly be on the look out. Once we reached the cliffs, I was amazed at how many tourists were there. The cliffs are one of Ireland’s most visited attractions, so be prepared for crowds. There is also a 10 Euro parking fee. Despite these, the cliffs are well worth a look. I do not like heights. The cliffs are dizzily high. I was amazed and alarmed that there is not a railing to prevent foolish tourists from going on an unexpected one-way trip. To add to my shock, we learned that 26 people have fallen from the precipice in the last 20 years. There is even a special rescue team trained just for the cliffs. They have yet to do an actual rescue because they have all been body recoveries. As long as you stay on the well marked path, you will be fine. Please do not try to get that amazing dare-devil selfie. I braved the heights and was rewarded with a breathtaking view. We could see all the way to the Aran Islands near Galway, which is our next stop. On top of the cliffs is O’Brien’s Tower. Cornelius O’Brien built the tower in 1835 as an observation platform for Victorian era tourists. Climbing to the top parapet gives you an even better view! It is an additional 3 Euro per person, however (cash only). Built into the hillside behind the cliffs like a giant hobbit hole is the visitor center and cafe. We had a wonderful tea while we looked out over the ocean. The coffee and cake helped me regain my nerves. I’m very glad that we didn’t pass up the cliffs a second time. We left the Dingle Peninsula for the small city of Ennis, but decided to take a short cut over Conor Pass. By now we have been in Ireland for over a week and about half way through our family adventure. I’ll admit, I am getting a little tired of driving. So, I decided to take a short cut over Conor Pass to liven things up. It is the highest public road in Ireland and largely regarded as one of the most dangerous roads in Europe. The road cuts across the Brandon Mountains linking Dingle on the south side of the peninsula with Kilcummin on the north side. The Brandon Mountains contain Ireland’s second highest peak, Brandon Mountain, at 3127 ft. Compared to the Cascades back home in western Washington they are mere hills, but are still dramatic and beautiful in their own right. The pass is very winding and narrow, but does have sum pull-outs where you can stop and let other vehicles sneak by, which was luck for us because we needed them. My short cut to liven the drive up definitely got my heart racing at times. Luckily, most Irish drivers are very polite, which cannot be said of all Europeans. The Brandon Mountains are steep and jagged due to the relentless work of glaciers during the last ice age. They have left their indelible mark on the pass. We noticed the characteristic cirque land features, which the Irish call corries. These steep amphitheater shaped valleys are dead giveaways that glaciers carved the area. Thankfully, we successfully traversed the Conor Pass and head along the north shore of the Dingle Peninsula. Our next obstacle was the Shannon Estuary. To cross this, we needed a boat. Luckily, the Shannon Ferry makes crossings twice an hour. Otherwise, we would have had to drive over two hours around the estuary. Being from the Seattle area, we are well accustomed to ferries so felt right at home. Once safely on the other side of the estuary, we made for our next bed and breakfast outside of Ennis. Ennis turned out to be an unexpected gem of a small city. I’ll get to that next time! On the tip of the Dingle Peninsula is Dunmore Head, the most westerly point in Ireland. We drove out to the small town of Dunquin to visit the Great Blasket Centre and Island. I had no idea what to expect, I had never heard of Blaskets. The Blasket Islands, in case you also didn’t know, are a group of small islands off the coast of the Dingle Peninsula. The largest of the six primary islands is Great Blasket. It was continually inhabited until November 17, 1953, when the government evacuated the last 22 residents because of the harsh and primitive living conditions. You can take a daily ferry to see the remains of the small community, but you need to transfer to an inflatable boat once the ferry reaches the island because there is no safe landing site. We skipped it. Instead of the boat ride, we opted for a long walk along the Siuloid na Cille. The 5 km walk was beautiful. The views of the Blaskets and surrounding ocean were amazing. After the walk, we had afternoon tea in the visitor center. I actually had coffee, but close enough. I really wanted to find the famous Sheep Highway. I’m not sure if it is actually famous, but I have seen pictures of it many times. We finally found it after some asking and searching. It is an old stone roadway that goes steeply up from a stone pier to the cliff top. It was used when islanders brought their sheep to the mainland for market. I wouldn’t go out of your way to find it, but we were in the area anyway. Elijah was looking for a nice leather wallet, so we headed inland and looked for Holden Leather. Holden is the epitome of fine Irish leather work. Their leather goods are of exceptional quality and craftsmanship. We visited their shop and factory outside Dingle. The owner was very friendly and helpful. He explained the care he takes in designing and making his unique leather products. I really want one of his messenger bags now! Unfortunately, the wallets were out of Elijah’s price range. He could buy one or have money to put in a wallet, but not both. Last stop on our trip around the Dingle Peninsula was the Gallarus Oratory. The small stone structure dates from the 12th century. What impressed me was that this tiny church has stood for almost a millennia untouched by time. It will probably be just like this a millennia from now. Our day trip around the Dingle Peninsula was very eventful. We are equally impressed with both peninsulas. It is hard to say which one is prettier. You will have to travel both to judge for yourself. Let us know!